Hello, it is Keri, from Living In This Season. Organizing is something I absolutely love and am a little crazy about. My mind is always flowing with ways to tame the clutter. 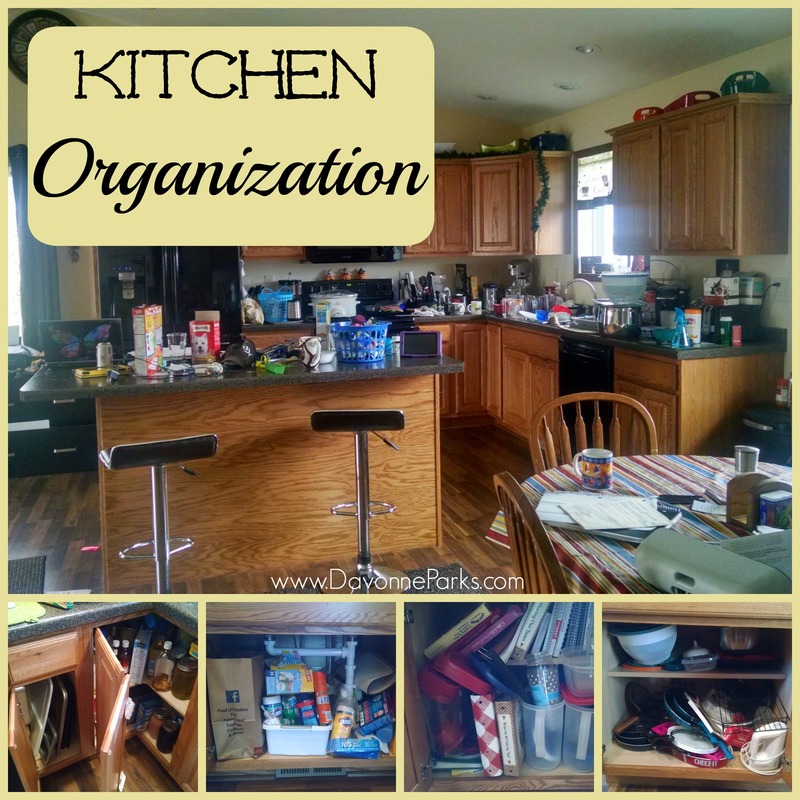 For today’s messy situation, we are hearing from a reader about her kitchen, and I am excited to share with her some steps to start clearing out the cabinets and counter tops. I am so excited to be able to assist you Emily, and hopefully this can inspire other readers as well! I have some steps that will hopefully help as you organize. 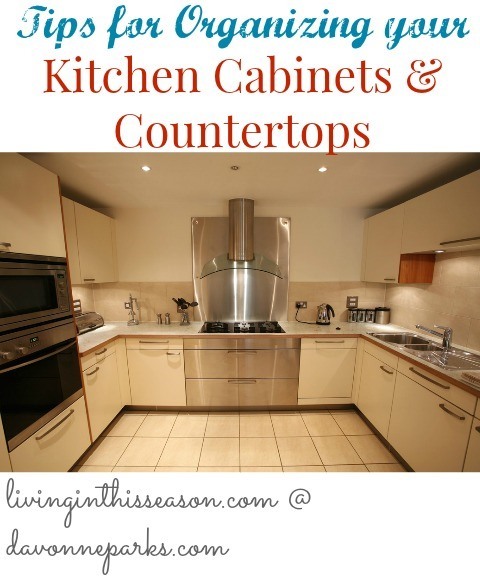 Personally, I would try to tackle the insides of the cabinets one day and then the counters the next day- or if you are adventurous- all in one day! Get 3 bags ready- donate, move to different location in house, trash. If we utilize the cabinet space, some of the items on the counter can be moved into the cabinets. 1) We are going to decide what you want in specific cabinets. It helps to group similar items together (pots and pans, baking sheets, colanders, tupperware, etc). 2) Now, you can pick a cabinet to start with and take EVERYTHING out. Sort the items by category as we talked about in step one. 3) If it is a food item, check the expiration date- expired- toss it. 4) Make sure the item has all the necessary parts, if it does not, place the item in a donate/giveaway pile (unless is completely useless then I would trash it). 5) Minimize. Have you ever used it? One time I was going through my cabinets and I found a lemon zester- I had never used it and honestly probably never would. I donated it to Goodwill and have never needed it since. Just be realistic- it can be hard, but it is so worth it. Another thing to keep in mind as you minimize is to ask yourself how many like-items you really need. For example, do you need 9 skillets and a dozen spatulas, or would 4 of each be plenty? 6) Wipe out the inside of the cabinets. Once every is out, sorted, and hopefully minimized, it is time to organize! There are so many amazing tips for organizing kitchens! Since everything is in groups, you can easily get things organized by using different methods. – Use drawer organizers to keep items separated and easily seen in your drawers. *** The best way you are going to keep your counters clear is if you all commit as a family to work together. Once your area is organized, explain to your family that everyone needs to put things where they belong. You can do this! I can’t wait to see your organized space! PS Go here to see how to get your own FREE personalized organization advice – fun rewards and freebies are available to those who submit messes by October 30th!